When Misha Quint was a young cellist studying at the Leningrad State Conservatory of Music, he had little idea that one day he would hop a plane, though without his beloved Derazay cello (the government demanded he leave it in Russia) and with barely enough change to jingle in his pocket. 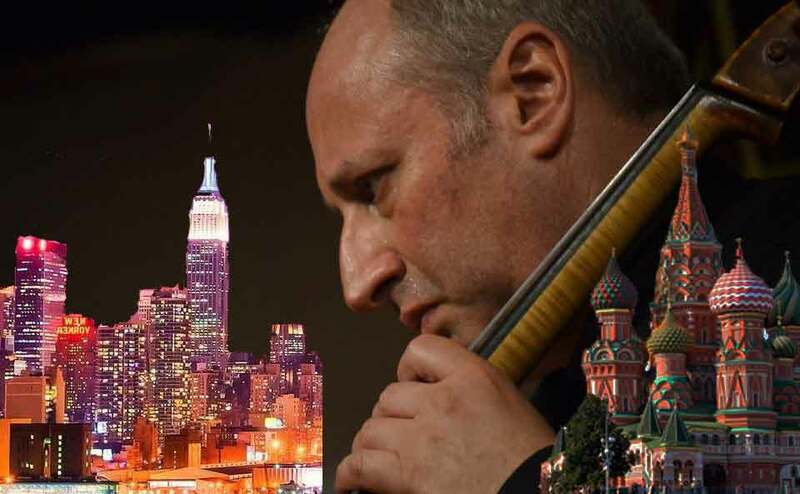 He was headed for Vienna with the ultimate goal of performing in New York City. 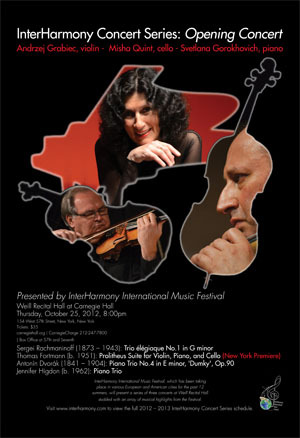 Now, 25 years later, InterHarmony International Music Festival, which Quint founded 13 years ago, will present the second of three concerts at Weill Recital Hall on January 24 at 8PM. 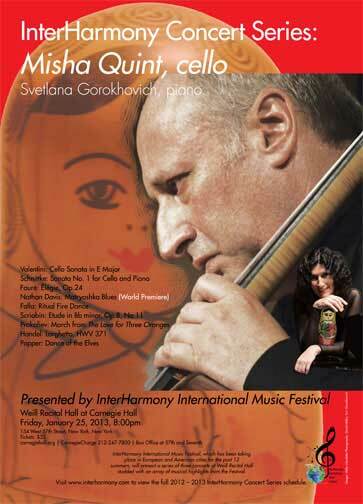 Quint will be accompanied by his long-time colleague, pianist Svetlana Gorokhovich. The quarter century celebration also includes the release of "Matryoshka Blues" on the Blue Griffin label in conjunction with the Weill Recital Hall concert. Among the January 24 concert highlights is the world premiere of Thomas Fortmann's "Sonata for Quintcello," a 13-minute witty and challenging musical tour de force. In one section Quint is required to invert the bow beneath the A and C strings in order to play them simultaneously. The result is a wickedly singular sound. The title, besides offering a nod to the name of the cellist, "Quint," and meaning fifth in Italian, also refers to the frequently occurring interval in this playful sonata. The 19th century French court composer François Francoeur will be represented by his "Sonata in E Major," at times a demonically fast work demanding the full virtuosic command of its two performers. Written when the composer was only 19 years old, Richard Strauss's "Sonata in F Major for cello and piano" brims with the lush beauty of late-Romantic music. Its opening is a tribute to pure sonata form, transforming into a serenade that is weighted with dirge-like gloom, tinged with wistful sadness. Then, following pure classic form, it concludes with the light joy of a Scherzo. Schubert will be represented with a transcription for piano and cello of his "Impromptu No. 3 in G Major, D899." Schubert's serenade is a classic example of the composer's beautiful lyricism and gift for long melodic lines. 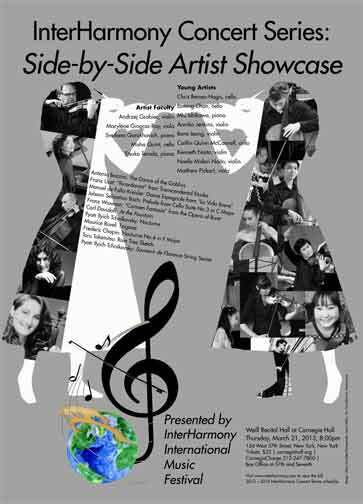 The concert will also include two short works by Igor Stravinsky, "Parasha's Aria" from the composer's comic one-act 1922 opera, "Marva," and his "Blue Bird Duet," an excerpt from Tchaikovsky's "Sleeping Beauty," which Stravinsky transcribed for chamber orchestra. Quint plays a cello version that was once performed as an encore by Mstislav Rostropovich, based on Stravinsky's chamber orchestra piece. Swiss born and now living in Italy, THOMAS FORTMANN began his musical career as a song writer, writing his first hit at 16 followed by over 100 titles released in more than 27 countries and sung by rock stars throughout Europe. Abandoning his pop music career at 26 to commit himself to "serious" studies in composition and instrumentation, Fortmann went on to receive fellowships and commissions from major European houses as well as from the University of Houston in the United States. Reflecting his attitude toward music and also his own rigorously constructed compositions, Fortmann says: "Music that is purely mathematical is non-sensual. 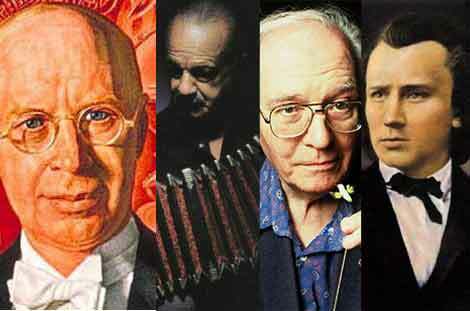 But music without mathematics is nonsense." 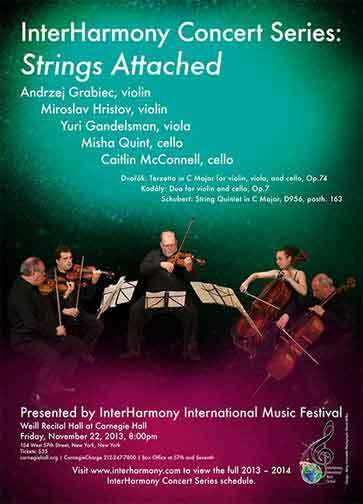 Igor Stravinsky (1882 – 1971): Russian Song, "Parasha's Aria"
Join us for a "Rite of String" concert, where prizewinning students and artist faculty perform in the same concert in a program with works by Brahms, Piazzolla, Prokofiev, and a World Premiere.